See that blog button on the left? The one with the turquoise and green strings!! It's my favorite string quilt. We'll have lots of sharing, lots of comments, lots of show & tell, and lots of cool things to give-away during the year. 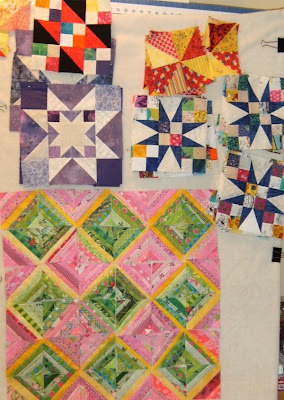 Here is my "Show and Tell" from my own personal quilt challenge to make as many string quilts that I could for one month. I started the day after Thanksgiving and ended it today. 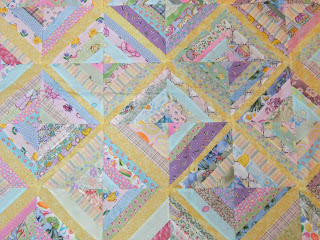 I got eight tops done, and have 3 quilted. They are going to be donated to kids in need charities. Thanks to all of you who sent me so many emails of encouragement and charities in which to donate them too. I am still going to make more, because I can't stop!! There are so many color combinations that I want to do and so many charities that would love to have them. Please keep you comments and emails coming . I love hearing from each and everyone of you. Watch for my exciting challenge. 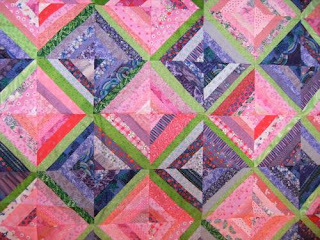 I am in the processing of organizing and setting up a great quilt-along. It is going to start in January. I am so excited. Forgot to post the New Give-Away on Sunday? Who loves Sock Monkey??? We do here. Take a peek at my store, leave a comment and you can have a chance at winning this cute tote bag made with Moda's Sock Monkey fabric. 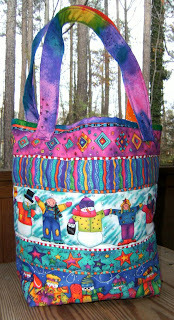 The tote bag pattern is from Kimmies Quilts. One of our favorites at our store. Winner will be chosen at random on January 8th. This is so true for us Southern Girls. If it's flat, cute and girly, we want it monogrammed. Talk about a difficult job. My last order was to monogram 4 zebra print umbrellas. You should have seen my Happy Voyager embroidery machine humming along. It's amazing that I didn't get the spokes of the umbrella caught or bent. 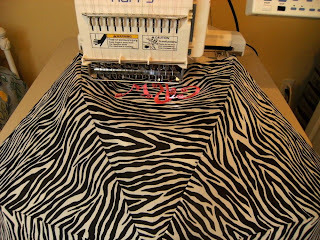 You don't want anything in the way of this embroidery machine while is humming along. I really thought I would have to press the emergency stop button on these. But alas, I still have all my fingers intact and there were no trips to the emergency room. Wheew! Congratulations to Donna. She is my winner for the KP Kids Christmas tote bag. 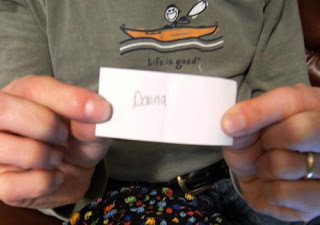 Donna please send me a quick email to sewfarsewgoodquiltshop@gmail.com with your address so I can mail your sweet gifty to you. Keep watching. Next week it's a different contest with a super cute sock monkey tote bag. We all get these phonebooks in March, Right? I found the perfect foundation for making my string quilts and it didn't cost me a penny. 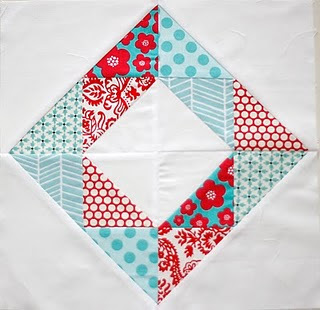 I decided that I wanted to make smaller blocks when I make my Heartstring quilts for charity. I can get a nice 6-inch square out of one page. 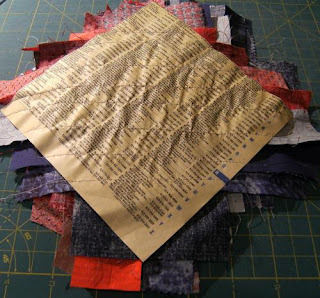 This paper is really easy to tear away after sewing my strips to the foundation. This little book "fit the bill ". But wow, you should have seen the floor in my sewing room. 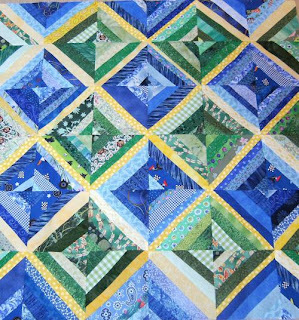 I went through 300 pages making all the quilts shown below. I tore out lots and lots of pages. 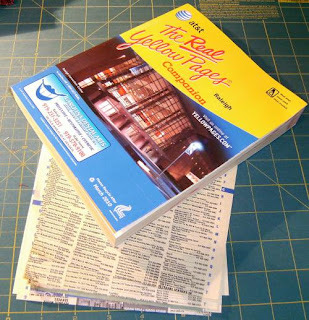 The nice thing about some of these phonebooks is that the ink does not rub off on anything or even mess up your iron. Do a simple check. Run your fingers along a page from the book. If you get residue on your fingers, don't use it. It will make a mess of your ironing board cover and your iron. 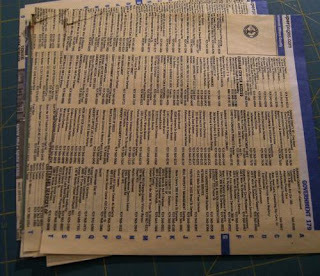 I asked some of my neighbors if they still had one or two of these phonebooks hanging around. Well, I got lots of them now. I think I will be able to make hundreds of blocks. My neighbors came through big time. I've made progress at last. 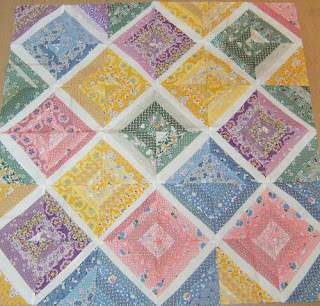 For one entire month, I am only working my string quilts to donate to charities that serve kids in need or kids in crisis. Feel free to recommend such a charity. So far, I have one going to the St. Jude's Research Hospital in Memphis, Tennessee. Thanks to Lauren H. who recommended this fine organization. 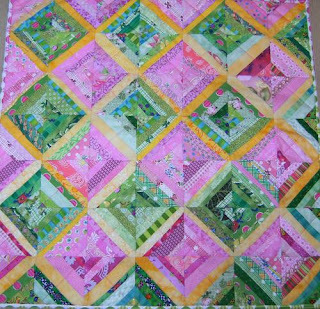 Sharing My String Quilts with You! Here is one of our shop samples left over from last year. This sweet little tote bag is made from a pattern from Kimmies Quilts. The pattern is an oldie, but still one of my favorites. 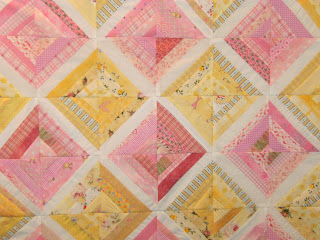 This one is made from a cute KP Kids "Snow Day" fabric from South Sea Imports. Sign up for our store newsletter, leave a comment and I'll announce the winner on December 13th. Please me sure to leave me your contact information. Good Luck and Bundle UP. It's getting cold out there!!! Between running my store, making kits, shipping orders, answering emails, getting ready and hosting Thanksgiving dinner for 12, kids coming home from college for the long weekend, Black Friday Shopping, where was time for me? There wasn't. 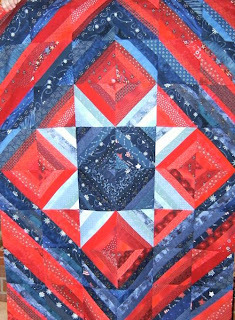 I usually only get to sew and quilt at night after spending the day in my office running my little quilt shop. After a quick assessment of all my UFO's, here is just a sample of what I am working on at the moment. I'm too embarrassed to tell you how many I actually have. 1. My purple "Shakespeare in the Park"
4. 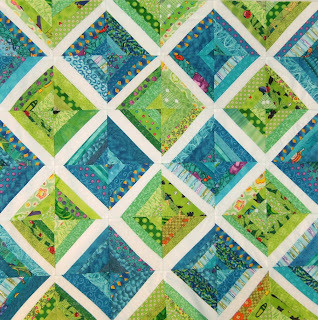 And my favorite color controlled String Quilt. Since this is my busiest time of year with my store, there really isn't any time for me again. 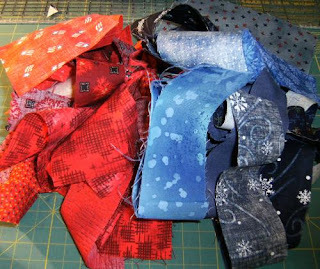 So, I have decided that for the entire month of December I am going to make as many string quilts that I can. I would like to donate them to a special charity for kids. 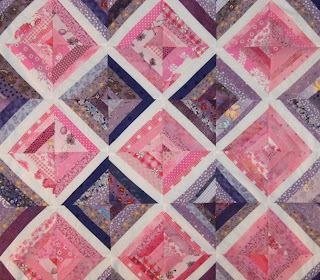 I love making these sweet color controlled quilts. We get lots of left over bits of fabric from end of bolts, crooked cuts, boo boos, and manufacturers samples. If you have a special charity and would like to recommend it to me, please feel free to leave a comment or suggestion.